I love camping. Well, actually maybe I love the idea of camping a little more than actually camping in a tent. Don’t get me wrong, I had wonderful memories of camping as a child, sitting around a campfire, late at night, roasting hot dogs and marshmallows. Sitting around a campfire is such a great social experience, catching up with friends and eating. I think camping has vastly improved from the experiences of my childhood. There are so many readily available modern conveniences, which has vastly improved what people can eat when they go camping. I think it’s called ‘glamping’ and it suits me fine. 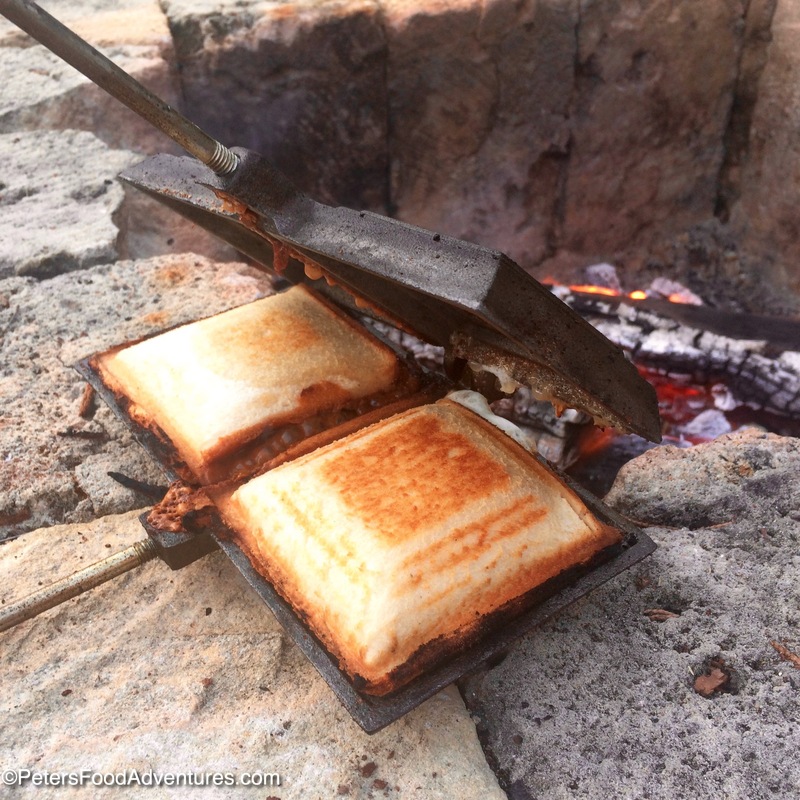 However, some classic camping ideas just don’t change, such as using a pie iron. It’s fun to create and cook your own food, with so many options with what to put inside. For savoury pie irons ideas, I like pizza, using pizza sauce, mozzarella and meat. Classic pie iron recipes usually involved buying canned pie filling, buttering the bread on the outside, and making an easy version of an apple pie, or blueberry or cherry pie. There’s nothing wrong with the classic pie iron recipes (which I love) but it’s great to explore new recipes. These are 2 of my new favourite pie iron recipes. To make the chocolate caramel, it’s really quite self-explanatory isn’t it! Find a caramel spread or use Dulce de Leche and add chocolate pieces. I like to use the Lindt chocolate balls as they are creamy, soft and just taste delicious. We tried the Hershey Kisses cut in half, but they didn’t melt as good as the Lindt. Lemon Meringue Pie is one of my favourite pies, so it was a no brainer to try to make a Lemon Meringue Pie Iron recipe. Lemon curd is used as the base for this pie, you can find it here. Otherwise just buy lemon curd or use a lemon pie filling as your spread on the bread, then add a few marshmallows and toast. Eating Lemon Meringue Pie whilst camping, I think, is a little bit fancy! We love using the fire pit in our yard where we can cook and entertain year round. Pie irons have become a bit of a novelty that’s lots of fun to make with the kids, whether we are camping or just pretend camping. Bon Appetit! Приятного аппетита! Spray a generous amount of non-stick cooking spray on inside of both sides of the pie iron. 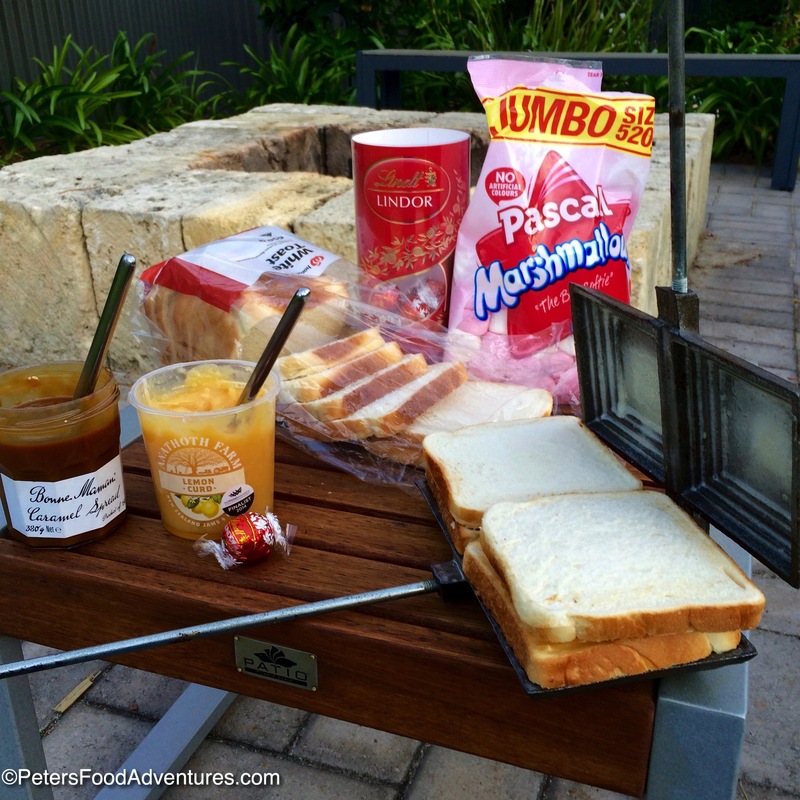 Choose your filling of choice (lemon or caramel) and spread on both pieces of bread and place on the pie iron. Add the 2nd filling to the pie iron. For lemon meringue, I used 4 small marshmallows, and for the caramel, I cut 2 Lindt chocolate balls in half. Close the pie iron, cut off the bread edges. I cut off the bread edges during the toasting, as I find it's easier to cut off crispy bread, your choice. Cook over your campfire, turning often to get it nice and golden brown inside. The iron needs to heat up and this will take at least 5 minutes, but depends on how hot your fire is and how close you are holding it (hold it pretty close). When the pie is golden brown, carefully remove from pie iron and allow to cool, as the insides are incredibly hot. Seriously, allow to cool so you don't burn your mouth. Enjoy and repeat! The combinations are endless! Thank you for the memories! We used to make these at Girl Scout camp when I was little. Now I need to find an iron to make these with my kids! Lovely memories and an awesome treat…???????????????????? How interesting! I’ve never heard of a pie iron before!! Must see if we can get one of those over here. They’re so much fun! I hope you can find one! They have a few different names. I think in the UK they might be known as pudgy pies maybe? I love your adventurous zeal! They actually sound like they will taste good! Lemon and marshmallow..yummy! Looks tasty! We are camping this weekend. Our dessert is limited to “camp cake” or a muffin mix you just add milk to. 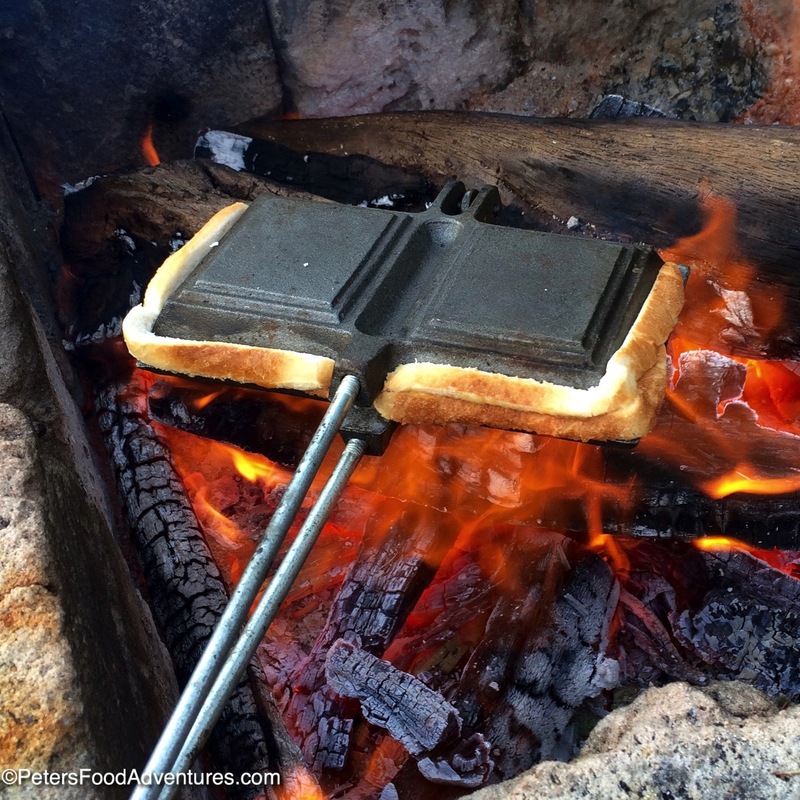 Since we hike to the camp site we just don’t have room to carry any extra equipment like a pie iron or bread that would get mushy. This would be fun in the backyard though. Can you really go wrong with Lindor Truffles?! Haha! Yup, I don’t think you can go wrong with Lindt anything!!! 🙂 Have fun camping!